It doesn’t get easier than this. A team of physical therapists write the content for you every 2 weeks. You customize your account just once, in the beginning, when you set up your account. Every 2 weeks, the content portion of the newsletter is updated (and your contact information, company logos stays the same unless you change it). This new newsletter is automatically delivered by email to your list every 2 weeks. The process is then repeated. Your patients are conditioned to know, like and trust you. Therapy Newsletter Can Do So Much For Your Private Practice …Take a Look! ON-DEMAND EMAIL BLAST TO YOUR PATIENTS. You get a lot more than just a done-for-you newsletter service with Therapy Newsletter. You get the ability to send your patients an email blast at any time, as many times as you want. NEW! Personalization fields are also included, so Amanda can get an email saying “Hi Amanda”, John gets an email saying “Hi John” and so on, allowing you to personalize your email contact with patients and other referral sources. ADD YOUR OWN CONTENT, PICTURES AND LOGOS. Give your newsletter your personal look and feel with custom headers, footers, colors and additional aesthetic options with our advanced online editor. With our unique technology, Therapy Newsletter allows you to match your newsletter with your unique corporate image. We invest heavily in the content and message of your newsletter every single time. Every newsletter article and every line of content is meticulously researched and engineered in-house by our team of talented and licensed physical therapists. But it doesn’t stop there. YOU get total creative control. Easily add content, edit content and exercise complete control to reflect your own company brand, image and treatment philosophy. You get done-for-you prospect stimulator eBooks, which act as ‘hooks’ for patients to part with their name and email address, allowing you to build your newsletter list (and everyone on your list automatically gets the newsletter twice a month). The best way to transform passive website visitors into active newsletter subscribers (and finally patients) is to capture their contact information to begin with. 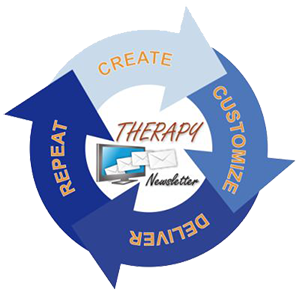 Therapy Newsletter completely automates this critical process since we give you plug-and-play forms that you use on your website to instantly transform website visitors into loyal newsletter subscribers. YOUR OWN REFERRAL ENGINE - AUTOMATICALLY ENCOURAGE PATIENTS TO REFER FRIENDS AND FAMILY. Did you know that Therapy Newsletter can help you get more patients by encouraging patients to refer friends and family? This is like having your own referral engine, working constantly to help you grow your practice. A happy patient, who is also on your newsletter list, is highly likely to reward you a referral. That’s why we created the “Refer a Friend” feature, which is a simple, yet powerful feature in your account. Through a sophisticated feature programmed into the newsletter, your patients are encouraged to refer their friends, family, and co-workers who they feel would enjoy receiving your newsletter. This is viral marketing at its best and it’s one of the fastest and easiest ways to grow your patient and prospect list. When a patient refers a friend, you’ll automatically receive an email with the information you need to contact your new prospect and schedule a possible consultation. These ‘referrals’ are also automatically subscribed to your newsletter and will start getting your newsletter every 2 weeks. This is completely automatic, and happens in the background 24/7, 7 days of the weeks. Discover How Therapy Newsletter Helps You Build Trust and Gain Credibility with Patients And Physicians. SHOWCASE YOUR EXPERTISE WITH ELEGANT NEWSLETTER ARCHIVES. Therapy Newsletter allows you to review, edit and send past newsletter. Showcase your newsletter archive on your website to increase engagement with website visitors. CUTTING EDGE ANALYTICS - OPEN RATE, CLICK THROUGH RATE, REAL-TIME EMAIL OPEN NOTIFICATIONS AND MORE. Easily track open percentage, broadcast dates, and always maintain a clean list with our exclusive hard bounce email removal system that automatically removes bad, invalid and mistyped email address. This results in high delivery rates for all your newsletters and email blasts. Real-time notifications of email opens tell you who opened your email newsletter and when, opening up new opportunities to interact with patients in real time. We don’t allow your subscribers to receive newsletter from our system, which gives you the ability to exclusively market to your patients. This unique feature is called ‘Email Exclusivity.’ When a lead or prospects opts into your newsletter system they can’t be added to another Therapy Newsletter account with the same email address. PRINT YOUR NEWSLETTER IN WORD – CREATE BEAUTIFUL, CONTENT RICH HANDOUTS. 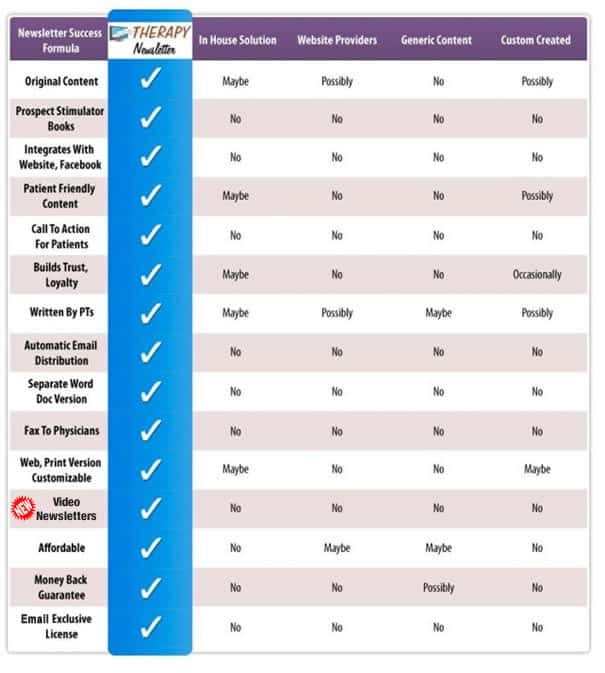 Want to get maximum exposure? It’s easy with Therapy Newsletter. Use the print feature to print out copies of your newsletter and pass them around to patients, doctors and local businesses. Use our proprietary “Physician Profiling Principle” (outlined in the member’s area) to get physicians to feature your newsletter in their clinics.